Silicone Watch Strap for iwatch is sport bands with durable and flexible silicone material that is soft, lightweight, safe and comfortable to wear. Also, it is sweat, rain, splash, water resistant. 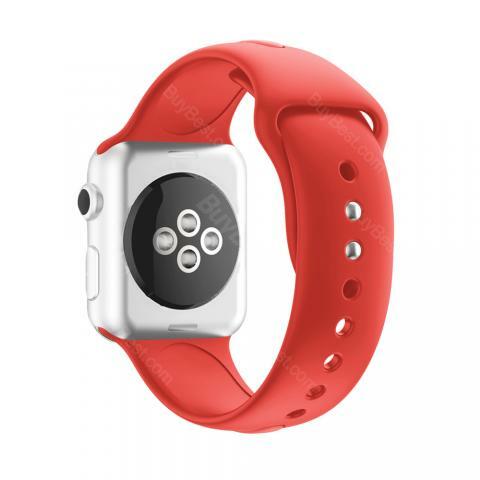 Silicone Watch Strap for iwatch is sport bands with durable and flexible silicone material that is soft, lightweight, safe and comfortable to wear. Also sweat, rain, splash, water resistant. The multiple holes designed for ventilate, breathable and comfortable wearing experience and stainless steel buckle to ensure your watch secure during strenuous exercise and a strap holder to secure the extra length. 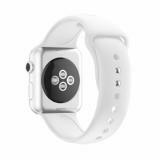 The band for iwatch comes with watch lugs on both ends, which locks onto Apple Watch interface precisely and securely. Easy and direct installation and one button removal. This replacement band for Apple Watch Series 3 /2 /1 can be adjusted to the right size according to your wrist circumstance. 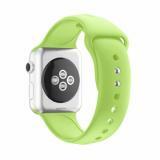 • Quick link: ET Silicone Watch Strap. Hope the strap won't loose after long time usage. The site ships fast, the item got ship out with one day. Change a strap; change a style for my iwatch. Nice! This silicone iwatch strap is soft and durable. Good looking and matching my sportshoes. This silicone watch strap for iwatch is a great looking band, but it's easyto put on. Great quality. Would definitely recommend to others. I love this watch strap. Nice quality, soft material, very comfortable ,no problem. Will be getting a couple more in different colors.